The Nelson Raintrain Traveling Sprinkler had 1,283 customer comments and 137 answered questions on Amazon as of this writing. I've read through the feedback left by customers and then condensed the results into this review. I hope that this helps you when shopping for a sprinkler. The Nelson Raintrain Traveling Sprinkler is made to cover 13,500 sq. ft. as it travels 200 ft. It has three different speeds for varying saturations. The body is made of heavy-duty cast iron with a chip resistant powder coat paint that is built to last. The aluminum spray arm is adjustable and made to provide a coverage range of 15 feet to 55 feet in diameter. It features an automatic shut-off and 3 speed settings including fast, slow, neutral and self-propelled. The Rain Train has an automatic shut-off which is made to prevent water waste. The shut-off ramp allow you to set up the sprinkler and walk away. Once the sprinkler gets to the ramp, it will automatically shut off. If you were wondering if this little train ever gets stuck, the answer is yes. It is possible for it to get stuck especially when the terrain changes to areas of no grass. Here a customer comments, "Mine gets stuck in bald spots, where there is not a thick grass mat on the ground. In those spots, the ground gets soft from the watering, and when the wheels reach that spot, they will eventually spin out and dig a rut, just like getting your car stuck." The Rain Train can be a conversation piece since it's so fun to watch. Here is one of the many comments about how entertaining it can be to watch this sprinkler do it's job, "Oh this baby makes watering your lawn fun. It has been a over a month of using it now and I am very glad I got it. It take a few tries to figure-out how to best layout the garden hose and adjust the arms to match my lawn. Otherwise this sprinklers is worth the money and even fun to watch." There were a lot of positive comments coming in from people who have a long and narrow strip of grass to water. Here is one of the many comments about long and narrow sections to water, "I have about a 150 foot long strip of grass that would require many many sprinkler repositionings to cover. This works like a charm and is so fun to watch. My neighbor is very enamored with it too. It seems very well made out of heavy gauge steel and weighs more than it looks. I guess it needs to be heavy to have enough traction to drag nearly a hundred feet of hose." If you don't have enough water pressure, the Rain Train may not travel at the higher speeds. Some considered it a flaw, but it is going to be dependent on your water pressure. A disappointed customer commented this about the travel rate, "Its travel rate on 'Lo' is much slower than the claimed 21 feet/hour. It took ours 7 full hours to travel about 70 feet." If you are on well water or any water system really, that has fluctuations in the water pressure, expect the Rain Train to stall and stop while pressure rebuilds. If you want the Rain Train to travel at a higher speed, it will help to use a lightweight hose. Also, some advised to keep the hose length to about 50" maximum. Otherwise the weight of the hose overloads the pressure of the water and the sprinkler will stall. The Nelson Raintrain Traveling Sprinkler is a fun novelty sprinkler that also can get the job done. Many people found it especially useful for long and narrow lawns. The automatic shut-off feature is popular for preventing water waste. It will help if you have a good supply of constant water pressure, otherwise the Raintrain could stop and appear to stall. It also can get stuck in areas that don't have grass. One thing is for sure, and that is, that people enjoy watching it work. It can be a fun conversation piece for visitors, children and neighbors. If you want to have a little fun while watering your lawn, I recommend buying the Nelson Raintrain Traveling Sprinkler. Here are some top questions that I found for people considering buying a Nelson Raintrain Traveling Sprinkler. 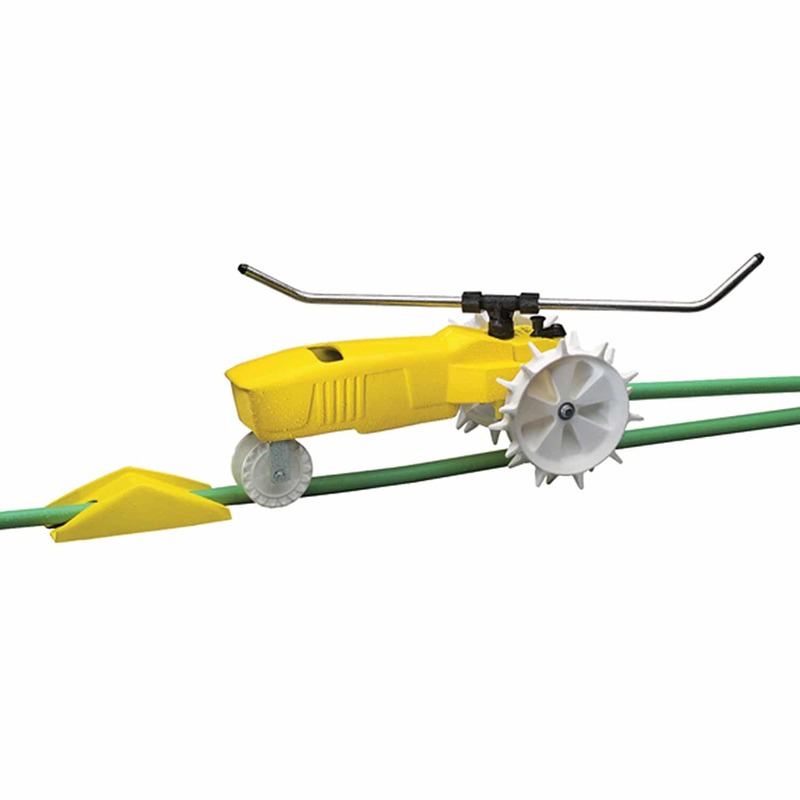 What is the difference between the Nelson 1865 and the 50970 Nelson traveling sprinkler? The 1865 has automatic shut off valve and ramp that hooks on the hose where you want it to stop, the 50970 just travels down the hose. How is it set up to provide good coverage? Also, does it work in flowerbeds or just open grass areas? The unit has a gear drive that is powered by the water going through it. It travels along the hose that you lay out and set the unit on. The coverage is controlled by the position of the sprinkler arms and the water pressure, which also controls the rate of travel. The unit has two speeds, and can be taken out of gear and set in one location. What is the smallest turn radius the tractor can handle? According to the manual, 8 feet is the smallest radius that the rain train can handle.